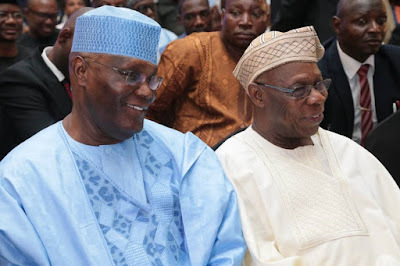 The All Progressives Congress has said it has received credible reports that ex-President Olusegun Obasanjo has made moves to get the United States of America to lift an alleged travel ban on former Vice-President Atiku Abubakar, who's the presidential candidate of PDP. But the American Embassy had said no case against Atiku. Acting National Publicity Secretary of the APC, Yekini Nabena said in a statement in Abuja on Friday that Obasanjo has made moves to secure United States entry visa for Atiku, whose candidacy he endorsed on Thursday. “The report further stated that then President Bush had on the strength of his report, barred Atiku and other corrupt politically-exposed persons from being issued visa to the United States, a reason for which he has been unable to travel to the United States till date." The APC spokesperson also said, “Former President Olusegun Obasanjo’s intervention in Alhaji Abubakar Atiku’s ban from the United States of America is evidence of Obasanjo’s legendary hypocrisy and self-serving interest in national affairs." On their part, Atiku's camp said APC should face their problems and stop bothering themselves about whether Atiku want to visit America or not, after all the President of America has not visited Nigeria.